Deniz Yilmaz, Identification of Manual Control Behaviour to Assess Rotorcraft Handling Qualities, Delft University of Technology, Faculty of Aerospace Engineering, 2018. 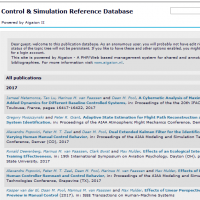 Tao Lu, Objective Evaluation of Human Manual Control Adaptation Boundaries using a Cybernetic Approach, Delft University of Technology, Faculty of Aerospace Engineering, 2018. Frank M. Drop, Control-Theoretic Models of Feedforward in Manual Control, PhD. Dissertation, Delft University of Technology, Faculty of Aerospace Engineering, 2016. Daan M. Pool, Objective Evaluation of Flight Simulator Motion Cueing Fidelity Through a Cybernetic Approach, PhD. Dissertation, Delft University of Technology, Faculty of Aerospace Engineering, 2012.